Every individual has a unique way that they experience and respond to stress based on their personality type. For ENFPs, a lot of stressors result from having to do activities and tasks that don’t line up with their preferences. For example, as intuitive-dominant types, they can become stressed when they have to focus on highly sensory activities and details. Over the years I’ve spent a lot of time studying personality type and stress, in fact, I’ve even written a book about it if you’re interested. In this article, I want to give you some helpful information on WHAT stresses out ENFPs and how they can find relief in easy, actionable ways. First of all, what stresses out ENFPs? ENFPs are most stimulated and inspired by envisioning future possibilities and moving forward with ideas for the future. They look around them and see potential in everything, and they want to see more and experience more so that they can find ideas and new inspiration. Having to spend a lot of time focusing on mundane, repetitive details (like paperwork, data entry, dishwashing, etc,.) can make them feel bored, restless, and even depressed. ENFPs are very empathetic, emotionally-rich individuals. They have very strong values and personal ethics. Having to be in conflict-ridden environments or do things that conflict with their deeply-held values will inevitably cause them stress. As perceiving types, ENFPs dislike being bound by a rigid structure or deadlines that are set in stone. Being pressured into making a decision or commitment before they are ready will heighten tension and conflict resulting from their lack of decisiveness will only make things worse. There are two types of stress that ENFPs can experience: Everyday stress and grip stress. First, let’s talk about everyday stress. 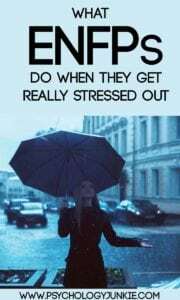 Regular, everyday stress is unavoidable and will result in the ENFP becoming more “ENFP-like” or true-to-type. Under stress, they will naturally resort to using their intuition to solve a problem. They will try to find a possibility that will fix the problem, or to brainstorm a solution. If that doesn’t work, or after trying that, they may get in touch with their feelings and try to determine what the morally right course of action is or what will coincide with their emotions and values. During everyday stress, the ENFP may overextend themselves or procrastinate. They may see so many possibilities or get so caught up brainstorming ideas that they get even more stressed out because they haven’t dealt with the problem at hand yet. They may become more sensitive or irritable than normal and start to feel alienated or lost. If they can’t find a way to manage the stress using one of their primary functions (Intuition or Feeling) then they may fall into the grip of their inferior function. ENFPs can have a grip stress reaction when they are under severe, chronic stress, or when they have worn out their dominant or auxiliary functions (intuition or feeling) and can no longer access them. When this happens they fall into the grip of their inferior function; Introverted Sensing. An ENFP having a grip stress reaction will seem more like an unhealthy ISTJ. This happens because they have worn down their dominant and auxiliary functions so that they are now inferior and tertiary, and their inferior function tries to come in and “save the day” therefore takes over the personality. ENFPs who are in the grip will seem unlike themselves in many ways. They can become obsessive and depressed, unable to see any possibilities or hope for the future. They may become hyper-aware of minor bodily sensations and worry about whether or not they are suffering from a serious illness or are at physical risk. They may feel paralyzed and unable to communicate clearly, as their thinking becomes cloudy and convoluted. They may feel overwhelmed, out of control, unable to sort out their priorities, and inflexible. Some become obsessed with record keeping, cleaning, or other mundane household tasks that would normally never appeal to them. Getting away from stimulation and other people can help ENFPs to sort out their own emotions and feelings via their auxiliary function, introverted feeling. They can re-center themselves on what’s important to them personally and rid themselves of extraneous worries and concerns. Exercise is an excellent coping mechanism for any personality type. Exercise releases powerful endorphins in the brain that reduce stress and clear the mind. Music can help the ENFP to get in touch with their emotions and feelings and sort them out. It can also inspire them and help them delve into their rich imagination and sense of hope. Many ENFPs mention blasting music while they exercise, while they’re home alone, or on a drive home from work as a great way to feel better and find equilibrium. Meditation or prayer helps the ENFP to calm down their mind, re-focus themselves, and get back in touch with their body. ENFPs who are stuck in brainstorming mode for too long can start to feel pulled in a thousand different directions and lose touch of their physical self and tangible needs. A calming moment to get in touch with spirituality, nature, or inner body sensations can transform their mood. ENFPs are inspired by new and novel experiences; they have an unquenchable desire to explore and find new adventures. Getting away from a stressful situation and seeing a new place, engaging in a new atmosphere, or just getting out in nature can really help them to be inspired and get a fresh perspective on what has been bothering them. ENFPs minds are often so active and full of ideas that they can burn themselves out. They tend to ignore their physical needs more than other types because they get so caught up in their visions and possibilities. Taking a break from it all when they start to get overwhelmed is important. Many ENFPs report that taking a quick nap or even just going to bed early can help them to feel refreshed and give them a new perspective on whatever is causing them stress. ENFPs, along with most other personality types, can find their way out of a grip reaction by accessing their relief function. In the case of the ENFP, the relief function is Extraverted Thinking. This function is often a pathway out of grip stress, pulling the ENFP away from their inferior sensing response, and their worn out intuition and feeling. Being able to get alone and talk out a problem, its cause, and the reason it’s creating stress, can help the ENFP to come up with a logical solution or plan to solve it. Do you have any stress-relief tips to add? What helps you to find calm in the midst of overwhelm? Let other readers know in the comments! The film doesn’t have sound…otherwise–a great article!